I can't stop thinking about it. 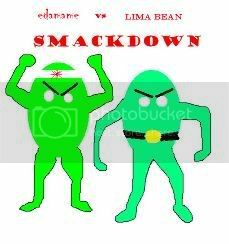 Tiny little lima beans wearing huge WWF belts and minuscule edamame in their little sumo-wrestler diapers, slugging it out for bean superiority. Not five minutes ago I ate a lima bean off sanguinity's plate to see if it would taste like an edamame. It pretty much did. Guess I like lima beans now. Looks to me like you've had quite enough drugs, oh surreal one. Dude, you really need to have someone straight around when you trip this hard. It's, like, in the rules, or something.